The following two articles have been provided by Barlow Bob, founder & organizer of the NEAF Solar Star Party and regional event host & lecturer on all things involving solar spectroscopy. You can read more about Barlow Bob and see some of his other articles at www.neafsolar.com/barlowbob.html. Galileo demonstrated that the Sun rotated by observing sunspot movements and argued that, based on these imperfections on the surface of the Sun, that the Sun was not perfect. This statement angered the Roman Catholic Church during the Renaissance. The church stated that God was perfect – therefore, the Sun was perfect, without blemishes. Unfortunately, he lost his sight caused by illness. He might have lost his sight by observing the Sun through his telescope without a safe solar filter. However, there is now a safer way to observe the Sun. The Sunspotter Solar Telescope can be used to safely recreate Galileo’s solar observation. You can confirm this rate of rotation and observe that the number of sunspots change over the Solar Sunspot Cycle. The Astronomical League even has a Sun Spotters Observing Award. The Sunspotter product is the safer solar telescope for observing sunspots. This unique solar telescope projects an image of the solar surface on a small piece of paper. Sunlight passes through a lens and is reflected off three mirrors and passing through an eyepiece that projects the solar image on to a small piece of paper. A group of people of all ages can observe the solar image at the same time. The Sunspotter creates an image of the Sun by eyepiece projection. After you align it with the Sun, light passes through the 61.7 mm objective lens, stopped down to 57.0 mm. It is reflected off of three mirrors into the 12.5 mm FL field lens. A 3.5-inch image of the Sun, magnified 56 times, is projected on to a white viewing screen. You can observe features on the Sun, in all wavelengths of light, as they would appear in a small refractor. 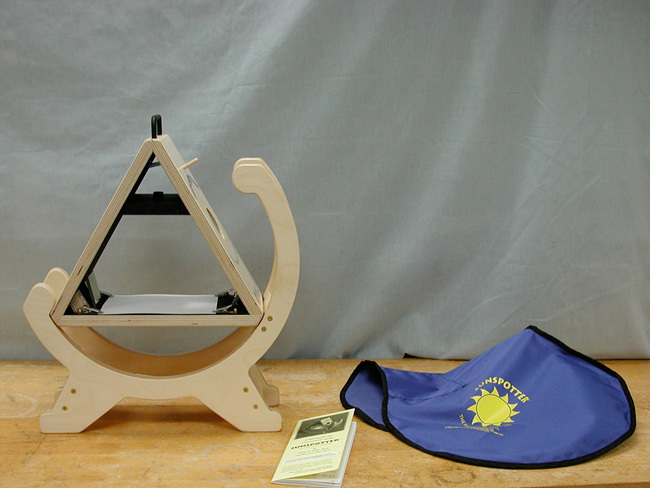 The triangle-shaped wooden telescope sits in a semicircle cradle. You can observe the Sun from 0 to 30 degrees. When you reverse the telescope in the cradle, you can observe the Sun from 30 to 90 degrees. This wooden folded-Keplerian telescope is constructed using techniques found in a fine piece of furniture. Perhaps the manufacturer should consider selling this product in a furniture gallery store. The Sunspotter appears to have been created by Al Nagler, in a seventh grade wood shop class, while the other students made salad bowls. 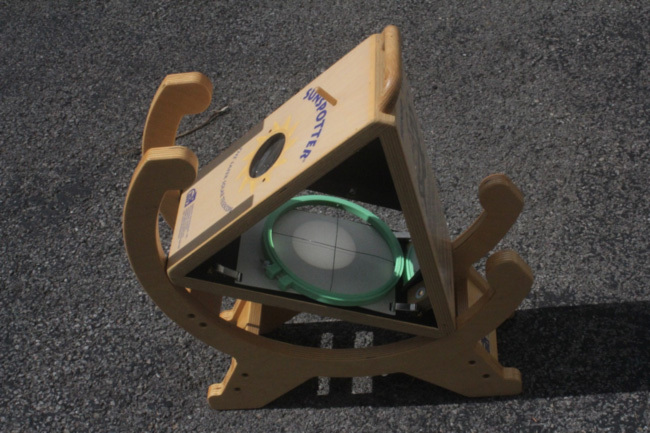 The Sunspotter was created for use in a classroom for a short period of time. However, to use it longer requires the ability to track the motion of the Sun across the sky. Upon arrival at a solar observing session, I set up a small canvas camp table on level ground. A two-foot-square thick piece of sturdy plastic or plywood is placed on the table, to create a stable platform. A television swivel stand sits on this platform. The Sunspotter is placed on the swivel stand, to create a simple mount to manually move the solar telescope to track the movement of the Sun. You do not notice the movement of the Sun across the sky over a short period of time. However, you do notice the movement of the Sun at sunrise or sunset, when it is against the horizon. Kids of all ages are fascinated by the projected image of the Sun in the Sunspotter, dancing across the white viewing screen. Most people are surprised to see how fast the solar image moves across the viewing screen, caused by the rotation of the Earth under the Sunspotter. Students and teachers have taken a video of this movement of Earth for science projects. It is very easy to align this cleverly designed solar telescope with the Sun. There is a gnomon, consisting of a short wooden rod on the front, above the objective lens. Simply point the front of the telescope in the direction of the Sun and move the telescope until this gnomon no longer produces a shadow on the front of the telescope. Two points of light are projected on the back inside through two small holes on the right and left of the objective lens. Two small circles are drawn on the rear inside. When you align the tow point of light inside of these circles, an image of the Sun is projected on the white viewing screen under the eyepiece. This product is extremely easy to operate. I shared the Sunspotter at a Boy Scout Summer Camp – while a father was reading the operating instructions on the back of the Sunspotter, his six-year old son aligned the telescope. The son watched the previous scouts align it. YOU DO NOT GET A SECOND CHANCE IN SOLAR ASTRONOMY! While the Sunspotter is the safer solar telescope, it is also the cooler lunar telescope. You can also use the Sunspotter as a Moonspotter to observe the Moon from First Quarter to Third Quarter. I even used this product to observe a Lunar Eclipse. The wooden Sunspotter solar telescope has an extremely unusual shape. The central part has a triangular shape, containing an objective lens, three mirrors, and an eyepiece. The mount has a crescent shape with feet on the bottom. Manufacturers of cases for astronomy telescopes and accessories do not make a padded case for the Sunspotter, with its unique shape. This product was shipped in a large cardboard carton, with a hard fitted foam interior. The Sunspotter fits securely inside of this shipping carton. I carried the Sunspotter into a music store. People who are not amateur astronomers look at you funny when you carry a weird looking wooden object into a music store. I told the store employee that I was looking for a large padded drum case to hold this wooden telescope. The employee showed me several cases. The Sunspotter fit perfectly into one case. When I placed the Sunspotter on its side in the bottom of the drum case, there was additional empty space in the top. I bought a round foam pad in a housewares store. I placed this pad over the Sunspotter and I now store clothing in the top half of this case. Since I now store various small cases containing the parts of my other solar telescopes in the large drum case, I had to find another case to hold the Sunspotter. I left the Sunspotter in its shipping carton. However, this large box is difficult to carry from my vehicle to the observing field of an event. The bedding sales area of a local retail store had comforters on display stored in heavy plastic cases with zippers. These large plastic cases appeared to be the same size as the Sunspotter shipping carton. I considered buying a comforter, just to get this plastic case. While observing the Sun with Chuck and Carol Higgins, I mentioned my idea to buy a comforter to get a plastic case to hold the Sunspotter. They gave me an empty heavy duty plastic comforter case. The Sunspotter shipping carton fit perfectly inside of this plastic case with a handle. At an art supply store, I bought a small and large portfolio case used to carry art works. The television swivel stand and two-foot square piece of heavy plastic or plywood fit into these cases. I now can protect the Sunspotter and easily carry it plus the mount at a solar star party. This product was created for the vertically challenged. It has been rumored that elves us the Sunspotter at the North Pole. However, they can only use it for six months – during summer vacation. I set the Sunspotter up at the annual NEAF – Northeast Astronomy Forum – in Suffern, New York. Amateur astronomers were fascinated with this product. Some ATM people photographed it or used a video camera. Others took measurements or made drawings of how it was constructed. They probably stopped at Home Depot on the drive home to build their own wooden Sunspotter. If Galileo had used the Sunspotter, he still would have been in trouble with the church. However, he could have retained his eyesight. This unique solar telescope projects an image of the solar surface on a small piece of paper. A group of people can observe the solar image at the same time. Kids of all ages are amazed at how fast the solar image moves across the piece of paper. You can also observe the Moon through this telescope. Several years ago, someone told me about an additional educational activity using the Sunspotter. When you observe the Sun, where is the solar equator? You can use the Sunspotter to find the solar equator. A six-inch embroidery hoop will fit on the piece of paper. 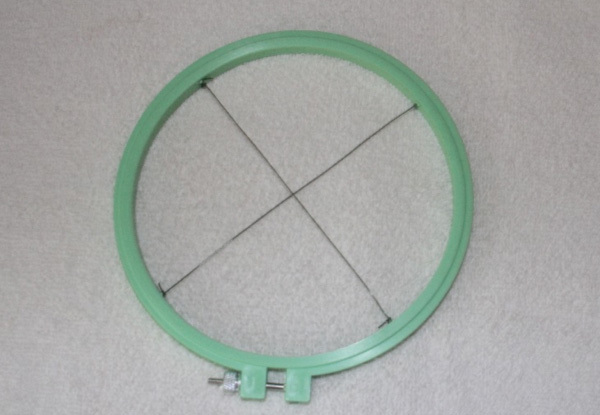 A wooden or plastic embroidery hoop can be bought at a craft store. Make a pen mark at the top and bottom of the hoop. Make another pen mark on the right and left sides of the inside hoop. Drill four small holes in the inside hoop at the pen marks. Finally, pick up a spool of the thin green wire used to attach gardening plants to wooden stakes – sold in hardware, craft or gardening stores. The completed embroidery loop and green wire. Thread the green wire through the first hole from the outside into the second hole on the opposite side. Continue to move the wire across the top of the inside hoop and into the next hole. The wire is finally threaded into the last hole. Wrap the two ends of the wire through the first and last holes several times to secure the ends. Once the wire has been threaded through the four holes, two perpendicular wires form a crosshair inside of the hoop. Attach the larger outside hoop to the smaller inside hoop and tighten the bolt to secure the two hoops together. The completed loop with Sunspotter. Place the altered embroidery hoop on top of the small piece of paper displaying the projected solar image. You will usually see two groups of sunspots between that equator and solar North and South Poles. As the solar image drifts across this piece of paper, keep moving the horizontal wire until the sunspots move in a line following the wire. This will show you the orientation of the Solar Equator. Sue French provided the following information and is used here with permission. The plane of our Solar System is defined as the mean plane of the Earth’s orbit. Earth is the only planet whose orbit isn’t inclined to the plane of the Ecliptic. If you still count Pluto as a planet, it has the highest inclination, Mercury the second highest, and Venus the third. The Sun’s axis is tipped with respect to the plane of the Ecliptic, so even if the Earth had no axial tilt, the Sun’s equator would appear high, low, or tipped depending on where Earth is in its orbit around the Sun (take a normally tilted globe of the Earth. Pretend that it’s the Sun and you are the tilt-free Earth. Walk around the globe to simulate your orbit around it, and see how the view of its equator seems to change). And the apparent tilt of the Sun’s equator with respect to the observer’s horizon would also change as the Sun takes its daily path across the sky for anyone that didn’t live somewhere along the Earth’s Equator. This will show you the orientation of the solar equator. You could also try this with solar eyepiece projection. science first does not sell the sunspotter for $349. Their price is $563.